Dunmore East: A Suitable Harbour for a Marina? Dunmore East is a charmingly located and picturesque coastal village, whose enormous potential as a holiday and maritime centre is blighted by having an outdated and rather drab industrial zone at its core. For it has the misfortune to be trapped in its historical position as a long-established fisheries port. This means that the administration of the harbour – which should be the pleasant heart of the village – has been rigidly strait-jacketed into serving and promoting the demands of the fishing industry, often to the exclusion and certainly the detriment of the possible needs of any other potential harbour users, both afloat and ashore. Were Dunmore East located on another part of Ireland's coastline, this might not matter too much. 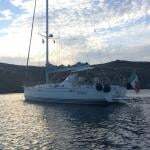 But the village is a popular holiday resort, and the harbour is in an absolutely key strategic location at local, regional, national and international levels in recreational boating. It is at the heart of a fine sailing area which – if there were proper berthing facilities available – would be ideal for hosting major events. An immediate example is the ICRA Nationals. Dunmore East would be a perfect location for this national annual cruiser-racer championship, yet there's no way it will be considered until the harbour is more welcoming to recreational boating. But not only is Dunmore a potential venue port, it is the gateway to the largely untapped cruising potential of Waterford Estuary, and the Suir, Barrow and Nore rivers. In any other country in the world, this beautiful cruising land of the Three Sisters would be perceived as a national treasure. But in Ireland it is still receiving only minimal attention because the key to the whole place, the gateway port of Dunmore East, has not been welcoming. Looking at the broader picture, Dunmore East's inhospitality affects the movement of cruising boats sailing along the coast. The large boat populations of the Irish Sea are discouraged from making the lengthy passage to the prime cruising areas of West Cork and Kerry because they're put off by knowing that if the urgent need arises, a visit to Dunmore East might not be a pleasant experience. Were the opposite the case, there would be an increase in the number of boats cruising the Irish coast generally. And a good experience in Dunmore East would also encourage them to sample the unexpected delights of cruising up to Waterford City or the port of New Ross, and visiting places little known to cruising men such as Duncannon, Arthurstown, Ballyhack and Cheek Point, not to mention the quiet anchorage behind Little Island in King's Channel. But you get only one chance to make a favourable first impression, and in recent years Dunmore East has been failing to do that. One of the saddest things about the place is the Visitors Book in the hospitable Waterford Harbour Sailing Club. Time was when each summer would produce a long list of the crews of visiting boats from near and far, and their enthusiastic comments. But these days the list has reduced to a trickle as the increasingly hostile demands of the harassed fishing industry have made the harbour bad-tempered, a place to be avoided. Yet just along the coast, 15 miles to the eastward beyond Hook Point, there's a smaller port which manages to be both a thriving fishing port, and a welcoming marina. 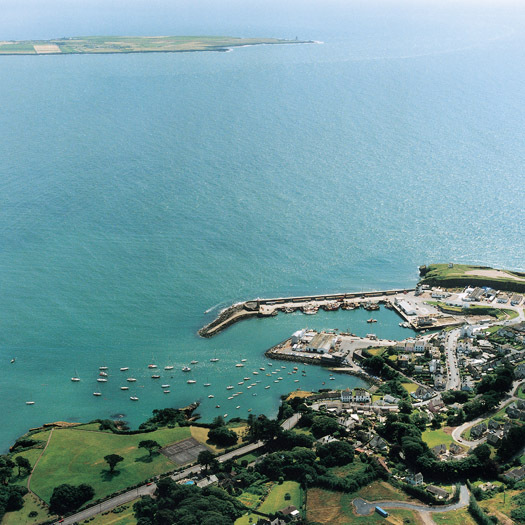 Kilmore Quay misses almost all the natural advantages of Dunmore East, as it's on an exposed and rocky coast. But it has just about everything else that Dunmore East lacks – it has enthusiasm, visible hospitality, and a can-do approach for boats of all sorts. 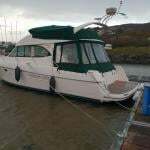 So though it has the disadvantage that once berthed there, there is little you can do except stay put if the weather deteriorates, in every other way Kilmore Quay is streets ahead. This is surely because Kilmore Quay is owned and run by Wexford County Council. With a vigorous council, enthusiastic county managers, and an energetic harbour master whose brief extends well beyond the stultifying limitations of the Department of Fisheries, Kilmore Quay is very much alive, while Dunmore East is moribund. This would be fine if Dunmore East continued to be a major fishing port, but that's now a moot point. Fishing is becoming more truly industrialized by the day, and big boats with highly automated equipment and smaller crews are taking over the most profitable parts of the business. A port like Dunmore East, with its small size and draft limitations, is increasingly by-passed by the major operators. For sure, there'll always be fishing out of Dunmore East, but with an inbuilt boat size limitation it will increasingly be towards the artisan end of the fishing industry. Currently, Dunmore East has probably now slipped beyond fourth place in the Republic of Ireland in terms of fish landings by weight. You get the picture from the 2010 figures by realising that at 163,447 tonnes, Killybegs outstrips all other significant Irish ports combined. Next in line is Castletownbere with 19,030 tonnes, while Dingle is third at 12,761. Although in 2010 Dunmore East was fourth at 8,387 tonnes, in terms of value it was outstripped by Kilmore Quay – Dunmore's landings were worth €13.6m, but Kilmore went for quality, and they got €13.7m for their 3,260 tonnes. And as Kilmore Quay has more in the way of fish processing plants, the value-added element to their smaller but higher quality catch is also greater than Dunmore East's. In Dunmore East, the continuing encroachment by the needs and expectations of the modern shore-based holiday market means that property is more profitably utilised if it's catering for the personalised needs of the hospitality industry, rather than as an impersonal industrial unit, particularly one with the anti-social aromas of fish processing. This decline in the fishing industry status of the long-established smaller ports is a European-wide problem, and a new inititative from Brussels seems to offer an opportunity for Dunmore East to be a suitable case for treatment, as interestingly revealed HERE. Although it all still requires confirmation from the European parliament, many of the EU's maritime nations such as Portugal are quite far down the line in planning projects which will take full advantage of this "post-fishing" scheme, which will involve some quite serious money to be available between 2014 and 2020. But however obvious the benefits which could accrue to Dunmore East, the rejection by the locals of a major harbour improvement project some years ago (it was to include a marina) has muddied the waters for future projects. The older generation in Dunmore East probably reckon they've accommodated enough change. Though the present layout will seem to today's generations to be a permanent feature of the environment, there are still many around who can well remember the massive re-vamp of the harbour when it was being undertaken by the OPW during the 1960s. It was meant to take about five years, but it took eleven. And at the end of it, the pleasant little cove of Dunmore, sheltered by an elegant pier designed in 1814 by the harbour genius Alexander Nimmo, had been changed greatly, with a breakwater extension going out beyond the pier, while within there was an enormous new concrete apron quay on a site brutally blasted out of pretty cliffs. Despite which, the kittiwake, most unusually nesting on cliffs which had become a central part of the village, had stayed on despite a decade of dynamite. The kittiwakes may have stayed on, but big fishing is going from Dunmore East. So how best to change the harbour for continuing viability, without destroying the much-loved character of the place, while at the same time profitably accomodating all possible harbour users? This year will see a small step towards providing berths for visiting cruisers. It's indicated on this latest ICC plan, and will be a 40 metre (120 feet) pontoon running lengthwise along the quay down towards the end of the pier, near the old lighthouse. Access ashore will be via steps that are let into the quay, and it's reckoned that up to twelve boats of average size can be accommodated. Every journey starts with a first step, but this particular first step by its location will require a lot of steps - in fact, route march is more like it - as it's about as far as you can be from the Sailing Club and the village without actually starting to depart from the harbour again. Welcome as this pontoon is, there's a risk that it might serve as a distraction from more imaginative action, and already there is another quayside pontoon in the southwest corner of the harbour for Dunmore East's many half-deckers. But here at Sailing on Saturdays, we'd suggest that to be of any real value, Dunmore East harbour needs more radical action, and our harbour design department has been busy. Any modification of Dunmore East harbour for use by craft of all sizes, and mostly smaller than today's average fishing boat, must take account of the fact that, in severe southeasterly gales, the outer parts of the harbour are extremely exposed. Up in the sandy cove off the Strand Hotel, where the ICC sailing directions quite rightly suggest anchoring if the wind is pleasantly between southwest and northwest, it is well known to YouTube viewers that a southeasterly gale (such as occurred on 15th August 2012) can produce impressive onshore breakers going clean over the inn. It's bad enough in a summer storm, and as for winter... in winter – when the traditional fishing season used to be at its height – Dunmore East could fill up with visiting Dutch boats, and after a period of severe southeasters the hotelier at The Strand went up to check his roof, and in the middle of it found a traditional Dutch wooden clog, swept in from the sea and popped up there by a mighty breaking wave. When the Strand Hotel is building up its clog collection in sou'east storms, there's quite a scend which can snake its war round the corner and into the harbour. And of course any yachts lying on the WHSC mooring immediately northwest of the harbour are having a very rugged time indeed. So the suggestion here is that we modify the harbour entrance to keep that scend at bay, and at the same time extend the Gull Rock through the current moorings to provide well sheltered space immediately northwest of the WHSC clubhouse. The first step in this project would be lengthening the extension to the Outer Pier. Every time you see the place in rough weather, you can't help but think that the engineer in the 1960s would probably have liked to make it twice as long in the first place. But if we're going to have our new breakwater coming along the line of the Gull Rock, in order for it to be long enough to be effective without closing the harbour mouth too much, we have to angle the new outer breakwater extension in a slightly more northerly direction. Not much, but enough to make all the difference to the channel room in the harbour entrance. The Gull Rock Breakwater is envisaged as being just that – a breakwater. It will have to be about a metre above High Water Springs, otherwise people will try to go over it as they do with the North Bull Wall in Dublin Bay. But the concept is that it's a breakwater and nothing more – no promenade along the top, and preferably made of rock armour to chime with the Gull Rock, though cost may make it necessary to build in tetrapods. 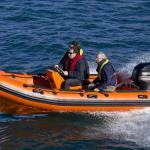 Thinking outside the box – Sailing on Saturday's line of thought for Dunmore East. The new breakwater suggested along the Gull Rock would simply be a breakwater, without a walkway along the top. Drawing by Afloat Studios. With the extended outer pier and the new Gull Rock breakwater, a well-sheltered area is created for the installation of a marina. That's the beauty of a marina. All it needs is an area of sheltered water with the required depth, and just one single point of shoreside access. There's no need for expensively finished quay walls - a marina is a minimalist installation, and extremely good value once the space has been created. We appreciate that there will be those who'll be horrified by the thought of any part of that pretty little coastline between the harbour and the Strand Hotel being enclosed behind a breakwater. But we'd emphasise that, as far as possible, the breakwater will be made to seem like a natural extension of the Gull Rock. And while Stony Cove and Badger's Cove will be within the new sheltered space, important locations like Men's Cove (Poul na Leenta) and Lady's Cove will be kept nice and fresh outside. With the marina in place, the entire dock area can revert to being exclusively for fishing boats. But with the industry being rationalized into a more compact shape these days, in time there could well be space for hauling out all boats and other manner of marine work taking place in there. Who knows, but maybe those pontoons running along the quays in the northeast and southwest corners of the harbour – a hugely wasteful use of quay space - might themselves become unofficial little marinas. I found one such in an eastern corner of Dingle Harbour last summer, and it seemed to be working in a harmonious way to accommodate boats of very different type and purpose. Well, there you have it – it's one idea for Dunmore East, doubtless there are many others. And although Sir Boyle Roche may have quite rightly opined that we should do nothing for posterity on the grounds that posterity have done nothing for us, for the sake of future sailors let us at least take note that the clock in Brussels is ticking, and the train with these new funds will soon be leaving the station.